Snake Bite Envenoming (SBE) is a major under-appreciated medical and public health problem causing significant mortality and morbidity, particularly among rural dwellers throughout the tropics. Occasionally, snakebite may lead to important complications such as amputation, blindness resulting from spitting cobra (Naja nigricollis) induced venom ophthalmia, foetal loss, wound infection, tetanus and scarring with potential for malignant transformation. Here, we report a case of a 13 year old student bitten by a snake whose bite site became infected with multidrug resistant Methicillin Resistant Staphylococcus aureus (MRSA). He was bitten on the neck, in the night while sleeping on his bed. The bite site suppurated, the skin underwent necrosis and began to discharge thick brownish pus necessitating surgical exploration to drain deep-seated abscesses. The patient survived the acute phase after receiving intravenous polyvalent anti-snake venom (EchiTab-Plus(R)) and intravenous Levofloxacin in addition to wound care. The case stresses the need for comprehensive care of victims of snakebite. This care should be multidisciplinary, and health care workers should be educated on snakebite wound care and management. Snakebite poisoning (SBP) is a major public health problem among communities of the savanna region of West and Central Africa. It causes significant mortality and morbidity, and globally, it is estimated that about 94,000–125,000 persons die from SBP. Snakebite is also an important cause of disability, notably amputation, mutilation, scarring, and blindness from cobra spitting venom into the eyes. It may also affect other organs in the body such as the brain with stroke; effect of snakebite envenoming on the heart and associated hemodynamic disturbances had been documented. Tetanus can complicate bite wound and often leads to fatal outcome. The commonest cause of death in the savanna is hemorrhage with incoagulable blood following saw-scaled viper (Echis ocellatus) envenoming. Presence of bacteria in venom or mouth of snake can complicate bite site causing wound infection. Indeed, the public health importance of snakebite has been largely ignored by medical science. 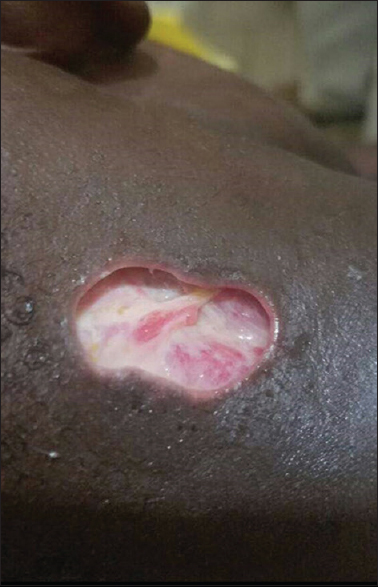 Inadequate health facilities, harmful traditional practices, and bacterial infections contribute to the morbidity and mortality associated with snakebite, and wound infection is a known complication after snakebites. Some venomous snakebites often result in hematoma and local wound necrosis, and necrotic tissue is an excellent medium for bacterial growth. Source of infection could be from unorthodox medicines applied to site of bite, hospital acquired or from the snake's oral flora. Studies have shown different snake species harbor multiple pathogenic bacteria. The infecting organisms may have also contaminated the bite wound from the victim's skin flora. Here we report the case of a 13-year-old student bitten by a snake whose bite site became infected with multidrug-resistant (MDR) Staphylococcus aureus. 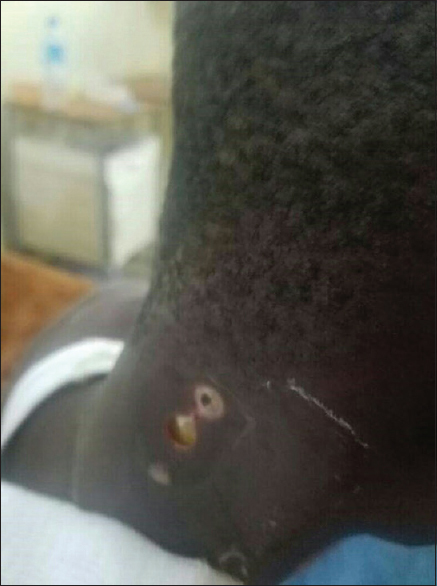 He was bitten on the neck, in the night while sleeping on his bed in a house somewhere in the suburb of Kano. He was brought to the medical emergency of Aminu Kano Teaching Hospital, Kano, Nigeria by his parents the following day with history of neck pain and swelling having been bitten by snake a day earlier. 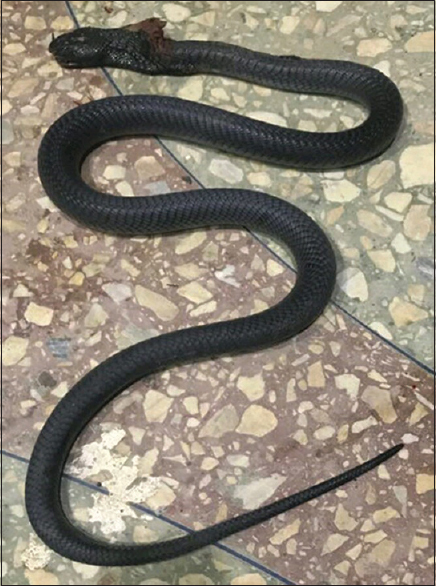 The patient had been seen in a general hospital a day earlier when he reported having painful swelling on his neck that was treated as “insect bite.” It was by the following day that a house help noticed “snake droppings” that led to the sight of a snake inside the victim's room and the snake was killed. They also brought the culprit snake, which was identified as cobra (Naja nigricollis) [Figure 1]. He had no history of bleeding from any part of the body, no difficulty in breathing, and no weakness of any part of the body. The victim was conscious though anxious, afebrile (temp. 36.6°C), and in slight pain with clear conjunctiva. His neck was swollen, tender, and the muscles were stiff. There were two visible fang marks on the right lateral aspect of the posterior surface of the neck. There was neither bleeding nor evidence of tissue necrosis at the bite site. His neck circumference measured at the angle of the jaw was 30 cm. He had no ptosis or other cranial nerve palsy and no other sign of neurologic deficit. He was not in respiratory distress as his respiratory rate was 20/min and oxygen saturation was 97% while breathing room air. His pulse rate was regular at 120 beats per minute with a blood pressure of 90/60 mmHg. No sign of bleeding from any part of the body. Urgent bedside clotting time done had the blood clot immediately. His prothrombin time, partial thromboplastin time activated with kaolin, and international normalized ratio were normal and his serum electrolytes and creatinine were all normal. His packed cell volume was 42% and white blood cell count was 9000/ul. The bite site was cleaned thoroughly with antiseptic solution and was left uncovered to be cleaned daily. Tetanus toxoid and anti-tetanus serum were administered and he was given oral amoxicillin/clavulanic acid. He was also given 4 units (40 ml) of polyvalent anti-snake venom (EchiTab-Plus ®). After 3 days on admission and while still on antibiotics, the patient developed high-grade fever with a temperature of 39°C but his neck circumference remained at 31.5 cm. The antibiotic was changed to intravenous ceftriaxone. By the fifth day of admission, the bite site had suppurated [Figure 2], the skin underwent necrosis, and began to discharge thick brownish pus necessitating surgical exploration to drain deep-seated abscess [Figure 3]. Gram stain of the pus revealed Gram-positive cocci in clusters and culture grew S. aureus sensitive only to levofloxacin and resistant to the penicillins including cloxacillin and nafcillin, cephalosporins, cotrimoxazole, erythromycin and clindamycin, a methicillin-resistant S. aureus. He did well on the levofloxacin and was discharged home on day 12 of admission [Figure 4]. Infection of snakebite wound is common and the source of infection could be the snake's oral flora, the victim's skin flora, or environmental contamination from the circumstances of bite and/or management. This patient was bitten at home and managed in the hospital, yet the bite site was infected with a resistant organism. The organism could have been driven into the bite site from the snake's mouth or from the victim skin. This case demonstrated the extent of morbidity that can be occasioned by snakebite. A number of case reports have demonstrated the isolation of MDR organisms from infected snakebite wound and studies have also reported abundance of MDR organism in the oral flora of venomous snakes. Goldstein et al. upon culture of venoms from American rattle snakes isolated preponderance of enteric Gram-negative bacilli and anaerobes. Huang et al. (2012) reported that cobra bite caused more severe bacterial infection than other snakebites and the isolated organism, commonly, Morganella morganae were usually MDR. This finding is similar to the index case where the culprit snake was identified to be a cobra. Liu et al. (2014) also reported a case of cobra bite wound infection caused by Shewanella algea, a rare MDR anaerobic Gram-negative bacillus. The same author reported isolation of MDR and colistin-resistant Pseudomonas aeruginosa from the oral cavity of venomous snakes in Taiwan. It is indeed difficult to predict which bite wound will be infected. The possibility of infection with resistant organism should however be entertained in the case of patients whose wound suppurates while still on antibiotics or who appear to be unresponsive to the antibiotics as with the index case. Such patients therefore require a more comprehensive review, including microscopy/culture and surgical debridement of necrotic tissue. The increasing isolation of MDR organism from Snake's oral cavity and infected bite wound may necessitate prophylactic administration of a more broad spectrum antibiotic, pending availability of culture, and sensitivity results. The case also demonstrates a case of snakebite at an unusual site as most bites occur on the limbs. However, the victim recovered fully following the use of potent and effective anti-snake venom, appropriate antibiotic, and surgical intervention. It also stresses the need for clinicians to examine bite sites thoroughly and consider the possibility of snakebite envenoming before treating “insect bites” casually. The care of victim of snakebite should be multidisciplinary. The index patient was admitted by physicians, received comprehensive review from medical microbiologist and surgeons. In addition to snakebite envenoming from venomous snakes, with its attendant hemodynamic/neurologic sequelae, snakebite victims can develop sepsis from infected bite wound, some of which may be due to MDR organism. The index case recovered fully following the administration of potent anti-snake venom, appropriate antibiotics, and surgical debridement, despite being bitten at an unusual site. Chippaux JP. Estimate of the burden of snakebites in sub-Saharan Africa: A meta-analytic approach. Toxicon 2011;57:586-99. Abubakar SB, Habib AG, Mathew J. Amputation and disability following snakebite in Nigeria. Trop Doct 2010;40:114-6. Karaye KM, Mijinyawa MS, Yakasai AM, Kwaghe V, Joseph GA, Iliyasu G, et al. Cardiac and haemodynamic features following snakebite in Nigeria – A study of 108 patients. Int J Cardiol 2012;156:326-8. Habib, AG. 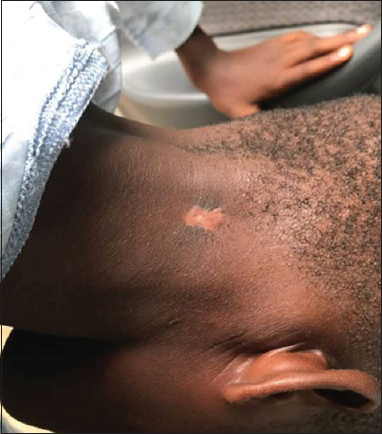 Tetanus complicating snake bite in northern Nigeria: Clinical presentation and public health implications. Acta Trop 2003;85:87-91. Theakston RDG, Phillips RE, Looaresuwan S, Echeverria P, Makin T, Warrell DA. Bacteriological studies of the venom and mouth cavities of wild Malayan pit vipers (Calloselasma rhodostoma) in southern Thailand. Trans Roy Soc Trop Med Hyg 1990;84:875-9. Goldstein EJ, Citron DM, Gonzalez H, Russell FE, Finegold SM. Bacteriology of rattlesnake venom and implications for therapy. J Infect Dis 1979;140:818-21. Huang LW, Wang JD, Huang JA, Hu SY, Wang LM, Tsan YT. Wound infection secondary to snakebite in central Taiwan. J Venomous Animal Toxins Trop Dis 2012;18:272-6. Liu PY, Shi ZY, Shyu CL, Wu ZY, Lai KL, Chang CY, et al. Cobra bite wound infection caused by Shewanella algae. Int J Infect Dis 2014;20:11-2. Liu PY, Weng LL, Tseng SY, Huang CC, Cheng CC, Mao YC, et al. Colistin resistance of Pseudomonas aeruginosa isolated from snakes in Taiwan. Can J Infect Dis Med Microbiol 2017;2017:7058396.